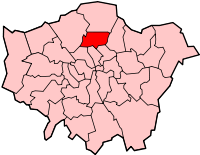 The London Borough of Haringey is a London borough in north London. There are some interesting sights, for example the stadium of the Premier League soccer club Tottenham Hotspur and the Alexandra Palace. This page was last changed on 9 March 2013, at 03:07.